Yesterday I reported at Search Engine Land that Google Video Search Now Includes YouTube Results based on a Google announcement. 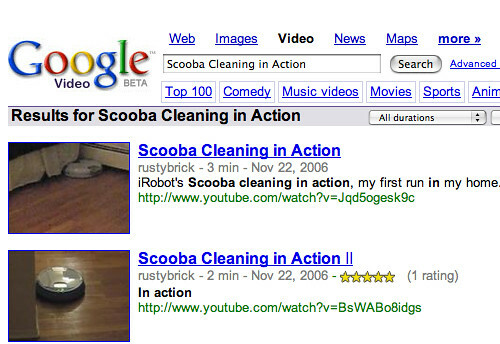 So a search on Scooba Cleaning in Action brings up my YouTube video that I used in My Scooba In Action post at Cartoon Barry. Part of the announcement clarified the roles of Google Video versus YouTube. Google's strength -- and its history -- is grounded in search and in innovating technologies to make more information more available and accessible. YouTube, meanwhile, excels at being a leading content destination with a dynamic community of users who create, watch and share videos worldwide. So Google will be more about the search side of things whereas YouTube will be more about the community aspect of videos. Previous story: More PageRank Changes at Google?